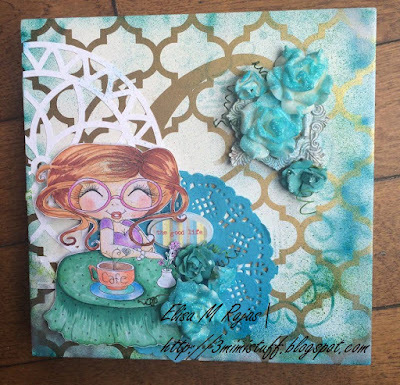 Elisa Rojas - Guest Designer! It is so wonderful to have people who love the eBrush show what they love to do with it. Elisa loves to use it to make shadows in her work. She also loves to tint her embellishments with it. You will see the roses tinted with the eBrush and then she applied glitter over them. The eBrush is a tool that can be used in various ways to polish your work! Thank you Elisa Rojas for sharing your beautiful work with all! Simply adorable Elisa!! Love it!